Charlottesville Mennonite Church, Charlottesville, Virginia, 2013. Source: Mennonite Archive of Virginia. 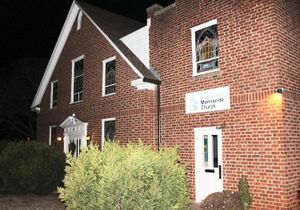 Charlottesville Mennonite Church (Mennonite Church USA) in Charlottesville, Virginia was founded in 1958 with Mennonite medical persons in the area. In 2014 the church had 53 members. Thiessen, Richard D. "Charlottesville Mennonite Church (Charlottesville, Virginia, USA)." Global Anabaptist Mennonite Encyclopedia Online. April 2014. Web. 21 Apr 2019. http://gameo.org/index.php?title=Charlottesville_Mennonite_Church_(Charlottesville,_Virginia,_USA)&oldid=121360. Thiessen, Richard D. (April 2014). Charlottesville Mennonite Church (Charlottesville, Virginia, USA). Global Anabaptist Mennonite Encyclopedia Online. Retrieved 21 April 2019, from http://gameo.org/index.php?title=Charlottesville_Mennonite_Church_(Charlottesville,_Virginia,_USA)&oldid=121360. This page was last modified on 14 April 2014, at 05:31.